Meaningful Play 2020 takes place on the campus of Michigan State University in East Lansing, Michigan. Most conference activities are located in the MSU Union. The MSU Union is centrally located between the MSU campus and downtown East Lansing. The MSU Union is a vibrant, multifaceted building containing shopping, dining, entertainment, as well as the conference facilities. East Lansing Marriott at University Place - located in the heart of downtown East Lansing, just one block from the MSU Union. The East Lansing Marriott features 180 well-appointed guest rooms, a concierge level, an indoor pool and exercise facility, meeting space suitable for any function, and dining in Bistro 43. The special conference rate is $154/night for single or double occupancy and is available through September 10 (based on space available). 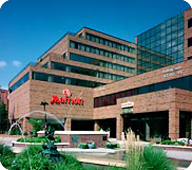 If you have issues booking with the group rate, contact the East Lansing Marriott directly at 517-337-4440. Quality Inn University - located about 1.4 mile from the MSU Union. The Quality Inn University offers a free full hot breakfast and features an indoor pool and game room. While it is a bit of a hike, it is walkable from the hotel to the Union. The hotel does provide a complimentary van service from the airport. The special conference rate is $90/night for occupancy of up to 4 persons and is available through September 10 (based on space available). If you have issues booking with the group rate, contact the the hotel directly at 517-351-1440 and mention "Meaningful Play 2020" to receive the group rate. However, there are several other lodging options located in the area. 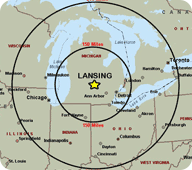 East Lansing is located in mid-Michigan, within driving distance of several major cities, including Detroit (~1.5 hours), Chicago (~4 hours), Cleveland (~3.5 hours), and Toronto (~5 hours). Detroit Metro International Airport (DTW) in Detroit, MI - 88.4 miles/1 hour 24 minute drive to MSU Union (directions). The Michigan Flyer provides bus service between the Detroit Metro International Airport and East Lansing. It drops off and picks up directly at the East Lansing Marriott. Alternatively, Amtrak's trains and the Greyhound Bus Line service the East Lansing Train Station daily - 1.7 miles/6 minute drive (directions). The Marriott and Quality Inn University have public and guest parking. There are several parking ramps and ground parking lots in downtown East Lansing near the MSU Union. On campus parking is available but public parking on campus is metered and therefore not the best option for parking all day. Michigan is known for its expansive sandy beaches (surrounded by the Great Lakes, it has the most freshwater coast line of all the 50 states), lush countryside, midwest hospitality, great universities, and of course, the U.S. auto industry. October is a perfect time to visit Michigan as the temperature usually remains moderate while the trees begin to take on their beautiful fall colors.